At least 171,400 people were killed or injured in the world’s 42 armed conflicts in 2014, according to the 2014 War Report. The great majority of victims were civilians. Iraq suffered the highest number of casualties (45,450 killed or injured), followed by Syria (31,253) and Afghanistan (23,578). Casualties in 2014 significantly increased, indeed almost doubled, compared to the 93,500 reported in 2013. The 500 page War Report is the only independent and comprehensive global classification of armed conflicts under international law. 29 of the armed conflicts were ‘non-international’ in character, between non-state armed groups or between one or more States and one or more non-state armed groups. These conflicts took place in 18 States: Afghanistan, Central African Republic (CAR), Colombia, the Democratic Republic of the Congo (DRC), Egypt, India, Iraq, Libya, Mali, Nigeria, Pakistan, Somalia, South Sudan, Sudan, Syria, Thailand, Ukraine and Yemen. Analysis also reveals the increasing use of explosive weapons in highly populated areas, such as Gaza and Ukraine, the rise of the Islamic State and affiliated groups in Egypt, Iraq, Nigeria and Syria, and the exposed situation of refugees and asylum seekers from conflict-affected areas. donors, judges and lawyers who work on human rights, humanitarian issues, and peace or security because "the classification of an armed conflict under international law is an objective legal test and not a decision left to national governments or any international body, not even the UN Security Council”. The War Report 2014 is divided into three sections. Section I reviews armed conflicts that took place in 2014 and their impacts. Section II categorizes and describes each conflict legally, focusing on its context, its causes, and the belligerents involved. The report also provides information on victims and alleged war crimes, their investigation, and (where applicable) whether perpetrators have been prosecuted. Section III analyses new and emerging legal issues and trends in warfare and identifies developments that require legal clarifications or stronger laws. The Geneva Academy of International Humanitarian Law and Human Rights is a research and higher education institution dedicated to the study of branches of international law that relate to situations of armed conflict. Jointly established by the Faculty of Law of the University of Geneva and the Graduate Institute of International and Development Studies, its fundamental and applied research in international humanitarian law, human rights, international criminal law, and transitional justice contributes to policy development and debate among scholars and practitioners, and in government. 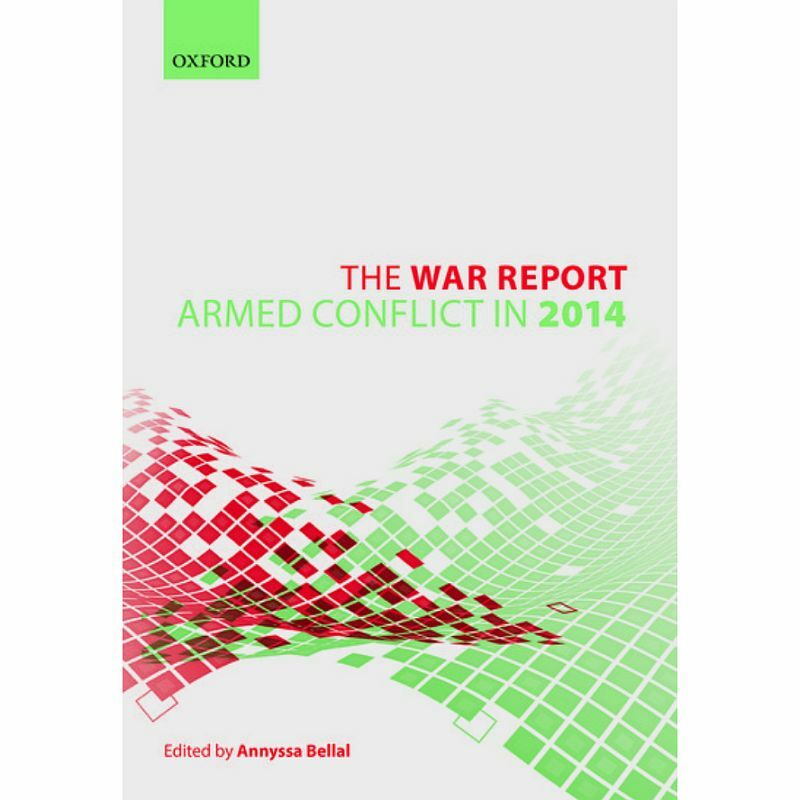 Dr Annyssa Bellal is the editor of the War Report 2014. She is also the legal adviser of the NGO Geneva Call and a lecturer at Sciences Po, Paris. Prior to this position, she was a full-time University Lecturer at the Irish Centre for Human Rights in Galway Ireland and a senior researcher at the Geneva Academy of International Humanitarian Law and Human Rights. She also worked as legal adviser for the Swiss Department of Foreign Affairs, the ICRC and the OHCHR. She received her PhD in public international law from the Graduate Institute of International and Development Studies and was hosted as a visiting scholar at New York University and McGill University. She published widely on IHL issues, notably on non-state armed groups.